The Sri Lanka Tennis Association organised a 'Development based training stint' at the Ramesh Krishnan Tennis Centre [KTC] in Chennai, India. Seventeen players participated, of which eight were selected from junior rankings and were given partial to full scholarship. All the players were between 10 to 16-years of age. The group was accompanied by George Paldano as the Coach/Manager of this evaluation and fact finding mission. Ramesh Krishnan, who was appointed Davis Cup Captain for India last week, and held 21 in the World Ranking in early 1990, is the man behind this successful training centre. His father, the Indian Tennis legend Ramanathan Krishnan 62, winner of Ceylon National title in 1958, appears every afternoon to work out the juniors. Many of our players had this rare opportunity. Many players from the centre are already in the Indian Rankings. At present, the number of players training at KTC looks very strong. One can easily expect many from the centre to dominating the Indian Tennis scene in time to come. They range from 12 to 18 years. Under 16 and 18 players also play the men's ITF and ATP satellite Tournaments. George Paldano who has played many times in India said the purpose of sending our juniors were based on very important reasons, as far as Sri Lankan Tennis is concerned. According to him, "our tennis is isolated". We do not have senior 'satellite' tournaments. India has this, as a result, Indian tennis is closer to that of the world standard. Our players have no opportunity to experience stronger challenge unless we leave the island. The only economical way to uplift our Base standard is to connect ourselves to India. Any other destination will cost a great deal more with limitations in exposure. Going to India is nothing new. It has been happening since the 1950's. We seem to have forgotten this important link in our recent development thinking. Arjan Perera, Chairman Coaching and Promotion thought about reviving this as he himself has experienced the Indian Circuit. Lalith Withana, Chairman, Finance committee, of the SLTA too has placed training programmes in the priority list. Especially when it is concerning the juniors. The "SLTA will allocate funds for such training programmes" was his bold assertion. Secondly our players rarely put the necessary number of hours and the necessary intensity, which is paramount for development. Being cut off from other involvements for 20 days our juniors practised six hours a day. The morning schedule began 6 am on court. After a warm up, players were allotted to courts by the resident coach Parama Hamsa former Indian ranked player. Ramesh Krishnan supervised work program from this point on. The Indian players from the centre joined in and the next 10 minutes are for knock up. First part of the session is concentrated on feeding exercises. There are eleven courts in the centre. Nine feeders with 120 balls per court start work. The feeding is based on different aspects on each of the court. Players are shifted around in the next 90 minutes according to the evaluation done by Ramesh Krishnan. The last 60 minutes of the morning sessions are for rallies. No session finishes without either rally or match play. Players return around 9.15 for breakfast. The afternoon sessions begin at 2.30 . There were some feeding sessions in the afternoon. Most of the Indian players arrive around three and 75% of the work is to gain control over the rallies. This is where a player discovers himself. In the afternoon session our players played games against the Indians. There are around 40 Indian players registered at the centre. The 'markers' who serve as feeders were good players and gave valuable match practice to the juniors. KTC is also the home of the 11 member ADIDAS INDIA TENNIS TEAM. On Saturday and Sunday both sessions were for match play. There was a very strong emphasis on match play training. Afternoon session finishes at 5.30, followed by a physical at the end of the day. Ramesh Krishnan's player evaluation is based on the experience he had in the professional circuit, on his way to be ranked 21 in the world. His approach is not to look "picture perfect" but to be effective during match play. This practical approach of his paid off well in the last 5 years. According to George Paldano his comments on our players were interesting. Naming Mahesha Seneviratne, Dinesh Kanthan, Harshana Godamanne, Amrith Rupasinghe, Nishendren, Chavi Thalagalla, Shasiuvaran Sabanathan and Franklin Emmanuel, he said their development up to now is good. Potentially they have everything others of their age have anywhere in the world. They show very low level of match experience and control over their approach to play serious tennis. His reference was toward the level of responsibility a player exhibits when they are left alone to practice. All this could change if they play good tournaments round the year. Ramesh and Ramanathan, both recommended playing more tournaments in India. Another salient question he placed was how far are they willing to go ? "Limited engagement up to the first public exam does not create good tennis players. These matters must be addressed in the future,"George Paldano said. George Paldano looked into the Indian Tournament Calendar. He said, during this visit we had match and tournament play only at KTC. However for the future the format of target will be different. After two weeks training the players will go for a few tournaments. He has contacted the Tamil Nadu Tennis association and the Indian Tennis Association, in this regard. "The Indian Circuit" has changed. The old format does not exist any more. The current format tournaments begin in the second week of October and goes on till the last week of May. The Under 14, 16 and some 18 tournaments are conducted by the all India Tennis Association, [AITA]. There are upto seven international tennis federations, (ITF) London, under 18 tournaments. Men's, women's and veterans are a mix of ITF Satellites and Futures; ATP Challengers (Association of Tennis Professional); AITA ranking tournaments; Very few are conducted by the state Associations. All these are prize money tournaments. Total prize money in India annually is around US$ 500,000. Most of the tournaments are 32 main draw, which means unless ranked, players will have to go through qualifying rounds. To participate in these tournaments players must be registered with AITA for Indian Rupees 500/- for five years. Tournament is not responsible for hospitality and travel as it used to be. While in India George Paldano has got in touch with other Tennis Centres. 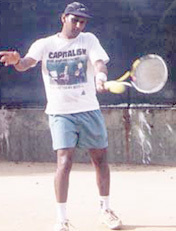 CGK Boopathy former Indian Davis Cup player, played many times in Sri Lanka and father of the current world doubles No. 1 Mahesh Boopathy has a centre in Bangalore, Mayur Vasant has been having a successful centre in Bombay. Bombay is well known for Indian Women's tennis. Kawajeet Singh has a camp in Chandigarh. Current Indian men"s under 16 and 18 title holders are from Chandigarh. CEO of Tamil Nadu Tennis Association Hiten Goshi conducts a camp for the association in Chennai. All-India Tennis Association has a camp in New Delhi. Balram Singh who has also played in Sri Lanka is in charge of this. The secretary of the All-Indian Tennis Association is Sham Minotra who was a regular to the island to play our nationals and Davis Cup. There are many possible avenues to develop our players in India and to gain tournament practice in the future. All participants returned home playing better tennis, more understanding of the game and commitment needed to be a good tennis player. Former Royalist and doyen of Sri Lanka boxing Eddie Gray, turned 81 not out on Dec. 21, '99. Gray, though greying in age has still got the vim and vigour to promote sports his first love - domiciled in Australia. The Sri Lanka Cricket Foundation in Victoria fittingly hosted him and his wife Evonne for a dinner attended by the Sri Lankan community. The Aussies, too were there in their numbers, according to Dr. Quintus L. De Zilva. Incidentally Gray, is a founder member. Legendary Gray, an Olympic boxer, a former president of the Amateur Boxing Association, has done much for the promotion of sports during his era - be it as a sportsman where he excelled in other sports like rugby, horse racing etc. He was in charge of the Police paddocks, when he served as an officer. After retiring from active sports, it was his skill in administration that made a tremendous impact for its promotion. Apparently even today no one could match his skills. Any job he takes over there is no question of one step forward and two steps backward, even with limited funds. A tribute to this effect was the holding of the Asian Boxing Championship here in the tram car shed which turned out to be a venue for this great happening unlike the present Sugathadasa Indoor Stadium. With his charming ways he was able to get a job done. Collecting funds was no problem. He has the knack to get the much-needed media support too to make his objective a reality. He was a senior official of the National Olympic Committee where he worked along with late Minister of Sports V.A. Sugathadasa. Sugathe was a lover of football, whilst Gray was for boxing, which sport he represented Sri Lanka in 1948 Olympics along with Alex Obeysekera, Albert Perera, John de Saram and the only Olympic medal winner todate - the late Duncan White, at the Wembley Stadium. Unlike today both disciplines hit a high spot and won much fame in the Asian region. Gray was one of the cornerstones for the creation of the Duncan White Sports Foundation along with celebrities like Kavan Rambukwella, Lakshman Kadirgamar, Eraj Wijesinghe, Vijitha Fernando, Ken Balendra, Neville Abeygunawardena etc. The Foundation is a lasting memory for late Duncan White, who passed away last year. Eddie and White were here to join in the Golden Jubilee (Independence). Todate, White is the only Olympic medal winner (Silver) at the Wembley Stadium, London in 1948. Last year, the Minister of Sports S.B. Dissanayake gave Gray a special award for his contributions for the promotion of sport. It didn't stop there, Dissanayake appointed him as our Sri Lankan representative in Australia to handle the Sydney Olympics to be held in June 2000.His contributions have been immense, to help young prospects to play in Australia, through the Foundation, to further improve their skills. The initial package to get the services of Dav Whatmore through the SLCFV was Gray's brainchild. To become old is great. But it takes lot of time. Now an octogenarian, Eddie is still rarin' to go like in the good old days when he punched and counter-punched his opponents to perfection. In all probability Eddie will be here along with Dr. Quintus, to watch the Mini World Cup (cricket) later this month. Every quick bowler who emerges will not be strictly scrutinized for the legality of his bowling action. Pakistan's Shoaib Akthar is the latest victim to be sidelined for suspicion of straightening a bent elbow at the time of delivering the ball. The issue has now reached a stage where should there be the slightest doubt international umpires bring to the notice of the authorities, their views on the action. There is no doubt that in the past many players who were on the border line got away with it. Now, so much becomes evident to the human as a result of slow motion TV facilities available. An action can be broken down from by frame and then frozen at any required point for the viewer to get a very clear picture of any bowler's action. The law is very clear. Even though there have been many controversies over the past four years the ICC has now sought to change or alter the rule in any form. All they have done is to appoint a sub committee of prominent former players who go into any complaints made by umpires and match referees. In simple language what does the law state? A bowler who when delivering the ball bends his elbow and then straightens it at release is deemed to sending a delivery that is not legal. Then the umpire usually the leg umpire has the right to call "no ball". For any bowler whose action is suspect it is a sickening call to hear. Should the calls continue then the captain has no other alternative but to remove the bowler from the attack.A player who is called for chucking or is constantly being watched is under tremendous mental pressure. At any level a career is at stake. At international it matters ever so much as a player's source of income, his livelihood, is totally threatened. Further, he gets labelled as someone who has cheated in some way. Because, in short chucking or an illegal action means that you are not bowling the ball, with a round-arm action, as it should be but throwing it. Whether rightly or wrongly it is said that the bowler then gets an unfair advantage. Usually, it is the quick bowlers, the medium pacers, the off spinners and the left arm spinners who could straighten a bent arm at delivery point. It is difficult for right arm leg spinners or left arm "Chinaman" bowlers to chuck. There are some common ways, based on the bowling action, that leads to the illegal delivers. Most of these bowlers deliver open chested. Should the front arm drop too early then the delivery arm could get bent as a result. Similarly should the front legs play opened too much and is also bent on landing and delivering then the chance to bend the arm is possible. Thirdly, bowlers who bend backwards from the hips at the point of delivery can also bend the arm as it is tough to rotate the arm in a perfect circle whilst bending backwards. Finally, bowlers who do not stand long enough on the front foot and pivot in the case of spinners, but fall over, can bend the arm as they do not use enough shoulder and hip but are arm bowlers. Bob Simpson, who is in the committee of the ICC that monitors bowling actions said this is a recent article he wrote. "The straightening of the arm holds the key and with the aid of the wrist, allows greater flexibility and rotation. There always seems to be a great deal of sympathy for bowlers who are no-balled for throwing. To some extent I can understand this, but what about the batsmen who have been dismissed by someone with a known illegal action? In some cases they have been struck frightening blows on the head and never played again. Others have lost their nerve or their place in the team. One thing that must be done right now by all the International Cricket playing nations is to get coaches involved with juniors aged twelve to sixteen to correct incorrect bowling action at that level. Coaches ignore bent arm actions because it can upset a youngster if he is told about it. Honestly it is important to correct an action early as it is far easier than to wait for later. Why wait until they become international cricketers. Surely, coaches would have seen these players perform from day one. Do it early and save the embarrassment for everyone concerned.